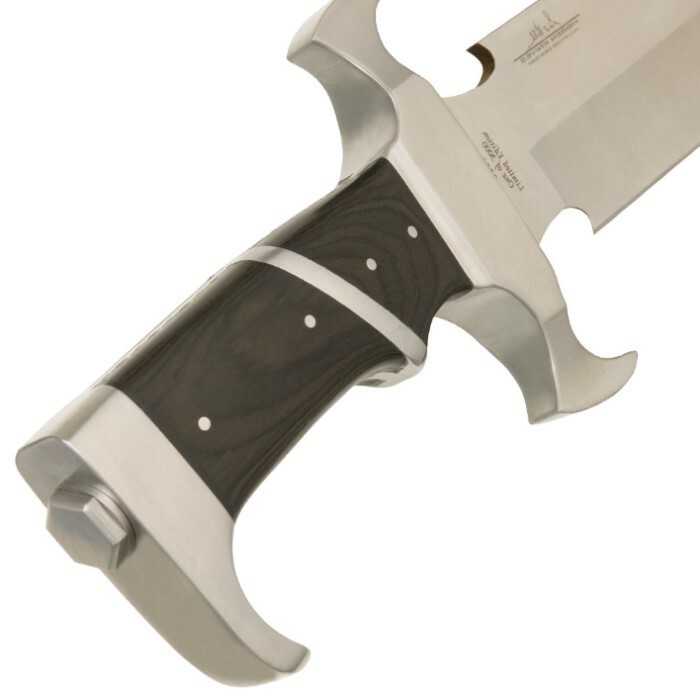 Gil Hibben 2011 Eclipse Bowie - Autographed Edition | BUDK.com - Knives & Swords At The Lowest Prices! Gil Hibben and United Cutlery teamed up to produce a series of annual knives designed by Gil in the early '90s. The annual series, better known as the Fantasy Series, soon became a tradition that continues today. 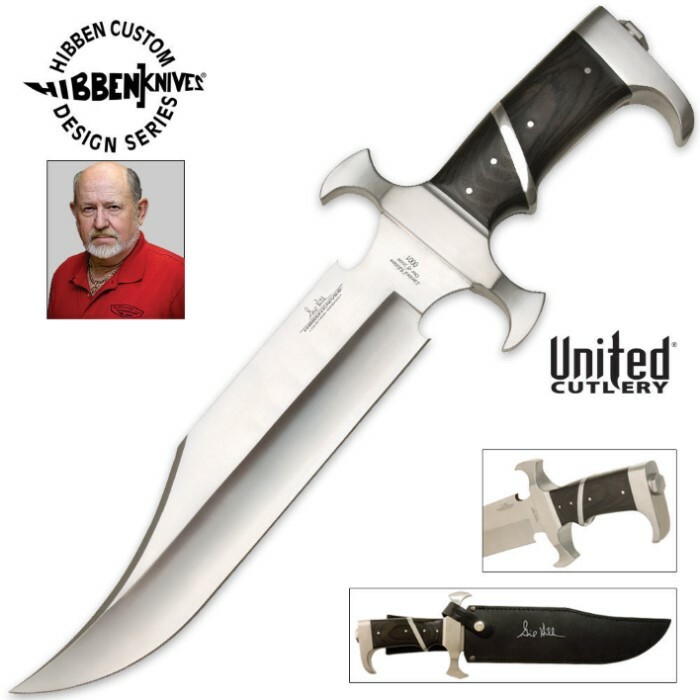 The 2011 Annual Series is the Gil Hibben Eclipse Bowie. It has an 11 3/8" AUS-6 stainless steel clip point blade and a pakkawood handle. The pommel and guard are striking in stainless steel and a leather sheath is included. This incredible Gil Hibben autographed knife is limited to 3,000 pieces. Don't be the one who misses out on it! When I got this knife, there was no sheath! I was a little disappointed in that, but The real letdown was when 1/4 of an inch of the blade broke off, and now the knife has no point. To be fair though, I still really love this knife and you should certainly get it! I got the knife and am very pleased with it however it was sent to me without a Sheath. I purchased it at full price and expected to get the complete piece. Kind of disappointing to tell the truth. Response: We do sincerely apologize for this inconvenience as this is not how we ship our products. We are shipping you a sheath for this item. Once again we do apologize for any inconvenience this may have caused. Pictures don't do this knife Justice. it really does feel incredible in your hands. of all the Hibben knives I own, this one up is at the top of the list, and I own almost all of them. This is one He** of a knife! This is a brute! Truly a work of art. I have mine mounted and framed on the wall. It is a sculpted work. Sharp, Massive, Intense. I had to mount it on the wall to keep myself from playing with it. Every knife enthusiast has heard "That's not a knife, This is a knife!" Oh SH** in comparison THAT one wasn't a knife either! THIS IS A KNIFE!!!!!!!!!!!!! The picture on the site can't do it justice. It is one you have to hold in your hand to get the real idea. I am going to one day buy another of these just so I can have one in each hand when they bury me. Taking it with me when I go. I love this knife. IMHO THIS is the BEST knife BUDK sells. What a BRUTE! You won't be disappointed. The Gil Hibben 2011 Eclipse Bowie is a real masterpiece. It's well made, feels solid and yes, it's big and heavy! Very happy with the purchase! I just received my knife. I have quite a few Gil Hibben knives, I love them all. This new part of my collection probably came to quickly, this is the finest of them all! The heft of this knife is awesome, I probably need to work out just to be able to handle it properly. BUDK supplies ALL of my Hibben knives. What a great compliment this is to my collection, it will be hard to beat! My Recon Bowie is my next favorite. I was in Recon with the Marines in Nam. If we'd had these knives back then, we would have won the war. Thank you BUDK! Beautiful, well-crafted, heavy, wicked sharp. Everything I was hoping for and more. Not sure what the autographed part was supposed to be. None on the sheath, where it usually is. When I first subscribed to Budk magazine this was the main knife that I wanted. Now that I've finally gotten my hands on it, I am reminded of why I made that decision. This knife is completely amazing. I'm assuming it has about a weight of 3 1/2 lbs and I'm assuming it'd really pack a punch. I mainly wanted this knife for two reasons, 1, I wanted a great knife to take hunting with me if I do get the chance to take an animal with just a knife (My dream) and 2, to show up my dad who's been bragging about his Gil Hibben knife that he recently purchased. I can safely say that I have accomplished both goals with this weapon. The only complaint that I have is that the first time I had this blade ordered, it got here with a slightly bent blade tip due to rough handling in the postage system as well as not having a plastic blade protecting tip. This was remedied when I shipped it back for a new one, and I am overjoyed with the end result. Also, the sheath comes a bit stiff and tight and worried me about the button scratching the blade, I solved this by placing a long screwdriver into it and leaving it overnight. By morning, I had a fully stretched sheath with more than enough room for the knife. Someone else had mentioned the handle being slightly too large and I'd have to disagree with them respectfully. 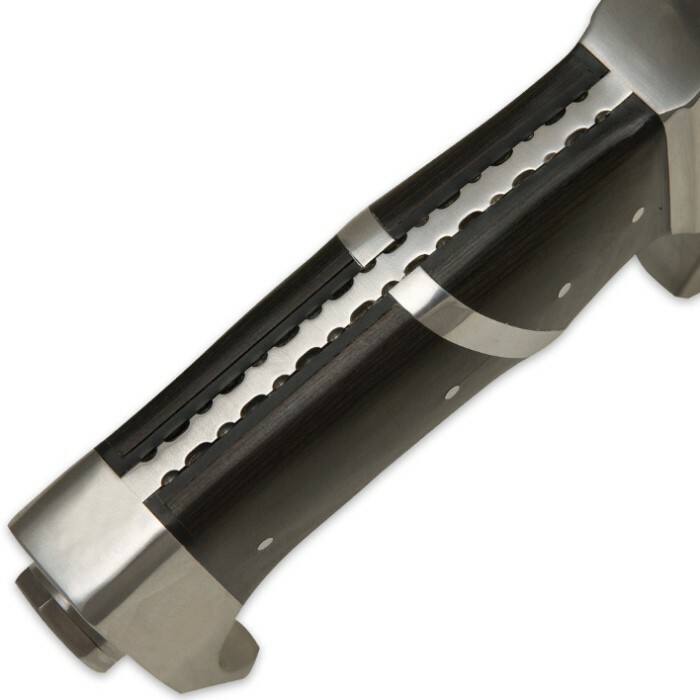 I feel as though the handle is the perfect size, and would look and feel disproportionate to the massive blade if it were any smaller. This has become my absolute favorite knife. As Crocodile Dundee said, "That's not a knife, This is a Knife!" And it is. I've waited two years to buy this to add to my substantial collection of knives. This is now clearly and easily number One. Wow, razor sharp out of the box, heavy, balanced, huge and pure eye candy. I took pics of it on my phone and sent it to everyone, knowing ahead of time that a lot of my friends wouldn't be too impressed because they're not 'into" knives, but I had to share anyway. Can't wait to buy more Hibbens but they'll be hard pressed to top this one.